Anthony Thomas, President, and CEO of Mynt with Hope Gokongwei-Tang, General Manager of Robinsons Appliances Corporation. Buying new home appliances or electronic gadget requires a big amount of cash. For those who plan to purchase but are uneasy about withdrawing and bringing a lot of cash, using GCash scan to pay is one way you can eliminate the stress. With GCash’s latest partnership with Robinsons Appliances Corporation, customers can now easily use the GCash scan to pay feature at its branches by simply downloading the latest version of the GCash App on their iPhone or Android phone, registering an account and loading up their GCash wallet at any of the 12,000 GCash partner outlets nationwide—including Robinsons Business Centers. Robinsons Appliances Corporation is the appliances and consumer electronics format of the publicly-listed Robinsons Retail Holdings, Inc.—the second largest multi-format retail chain operator in the Philippines and now one of the newest adopters of the scan to pay feature of GCash. It currently operates about 100 branches nationwide, offering a wide selection of quality appliances and consumer electronics to consumers. “We are happy to partner with GCash in their new payment service. 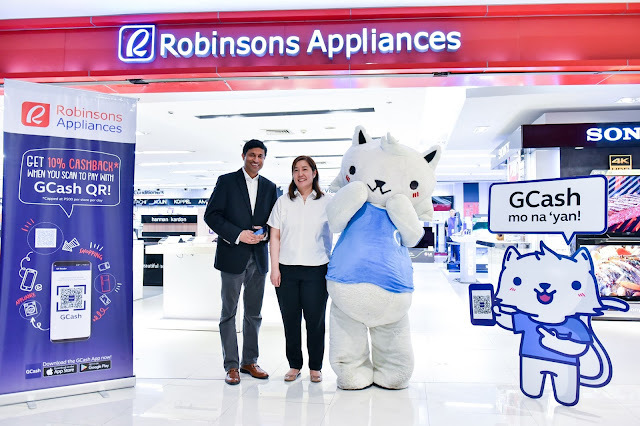 This delivers on our commitment to continuously improve our service by offering a more convenient and better shopping experience to our customers here at Robinsons Appliances” says Hope Gokongwei-Tang, General Manager of Robinsons Appliances Corporation. “Even if cashless payment is still a new concept in the Philippines, by extending the reach of GCash to more Filipinos we believe we can encourage more and more people to adopt this service which can provide them with an easier, more convenience, and more secure shopping experience,” says Anthony Thomas, Chief Executive Officer of Mynt, which operates GCash. Robinsons Appliance and GCash are currently offering a promo for consumers in Metro Manila. Until the end of March this year, customers who will use scan to pay at any participating GCash QR merchants will get a 10 percent cashback of up to P500. Using the GCash app, customers can easily pay by tapping Scan QR option on the app and point the phone's camera to the partner QR code to pay. By the middle of April, Robinsons Appliances will be accepting cashless payments via GCash in all of its branches nationwide.